England won the toss, Germany kicked-off. Adolf Hitler, up until the day before, was due to be in attendance, but he did not turn up on the day. Capt: Fritz Szepan, 26th captaincy Selectors: Josef Herberger, 41 (28 March 1897), appointed 1936. 22nd match, W 13 - D 6 - L 3 - F 58 - A 29.
team notes: This is the most experienced team that England have faced so far. Trainer: Tom Whittaker The fourteen-man FA International Selection Committee, on Saturday, 30 April 1938. 183rd match, W 117 - D 30 - L 36 - F 550 - A 212.
reserves: Arthur Bateman (Brentford AFC), Stan Cullis (Wolverhampton Wanderers FC), Willie Hall (Tottenham Hotspur FC, withdrawn) and Harry Clifton (Newcastle United FC). Ted Drake (Arsenal FC) replaced Hall on 6 May. When England play Germany in Berlin on May 14, the German Football Association will retain the whole of the gate receipts from the match, the English Association paying their own traveling, hotel, and other expenses. In 1939 or 1940 the Germans will pay a return visit to England, when the whole of the receipts will go to the English Football Association. These terms, it is stated in the English F.A. 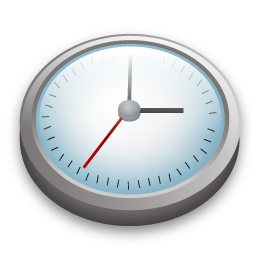 International Selection Committee's minutes issued yesterday, have been accepted by the German F.A. This match is remembered as much for the England team's rending of the Nazi salute during pre-game ceremonies in Berlin's packed Olympiastadion as it is for the result, a thumping for the Nazi regime's sporting pride and joy. It was Germany's last match before the World Cup 1938 Finals in France in June, and they were full of confidence on the strength of a 16-game unbeaten streak that had seen them go through 1937 with an opening draw and then 10 straight wins, albeit that record was inflated by the level of the opposition they faced. Sepp Herberger had become their second coach in September 1936, replacing Otto Nerz, and the only losses Germany had incurred since he took charge came in his fourth and fifth matches in October 1936, to Scotland in Glasgow 2-0, and to the Irish Free State in Dublin 5-2. Germany had become even stronger because the annexation of Austria in the Anschluss of 15 March 1938, just two months before the meeting with England, gave them the pick of the many fine players who had performed for Austria, perhaps Europe's strongest national side during the early 1930's and still a tremendous force, although Germany had beaten the Austrian Wunderteam 3-2 in the third place match at the World Cup 1934 Finals in Italy. After the Anschluss led to Austria's withdrawal from the 1938 World Cup Finals the month before this match--Germany notifying FIFA that Austria no longer existed--FIFA offered England a bye into the competition, but England rejected the invitation. According to Chris Nawrat and Steve Hutchings' The Sunday Times Illustrated History of Football, England were determined that Germany should not benefit from the Anschluss in this match and obtained an agreement that the German team would not include any Austrian players on the condition that Aston Villa would play a friendly match the next day against a combined German and Austrian team. Nonetheless, one of the players Germany lined up for this match, Hans Pesser, who scored Germany's third goal, had been an Austrian international. The Nazi rulers regarded the match as a wonderful opportunity for political propaganda, and the German team undertook preparations that were quite extraordinary for the time, two weeks of intensive training in the Black Forest. In contrast, per their usual practice then, the England team, arriving just after the close of a typically exhausting league season, played without any special training sessions. The English players were also far less experienced in international play than their German counterparts. Only captain Eddie Hapgood and Cliff Bastin had made more than 10 international appearances. Two, left half Don Welsh and center forward Frank Broome, were making their debuts, and inside right Jackie Robinson, who had made his debut a year earlier in an 8-0 victory over Finland, was earning only his second cap. Inexperience counted little on this day, however; Broome scored once and Robinson twice. 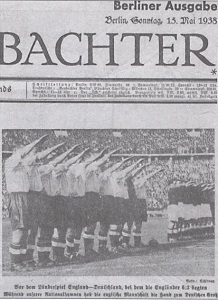 Before the match, at the direction of the British Ambassador to Germany, Sir Neville Henderson, and with the support of Football Association Secretary Stanley Rous, who would serve as FIFA President from 1961 to 1974, the England players joined in the Nazi raised-arm salute as the German national anthem was played and Nazi leaders Göring, Goebbels, Hess and von Ribbentrop watched. Some accounts say the English players did so reluctantly, but others maintain the fuss did not arise until the British press made it an issue. In any event, England then set about dismantling a very good German team, although sweltering heat eventually slowed them in the second half. Left winger Cliff Bastin, England's most experienced forward and longest-serving player, opened the scoring with a well-placed volley at 16 minutes, but Germany pressed and equalized four minutes later through inside right Rudi Gellesch. England then quickly took command of the match. Germany needlessly gave away a corner from which Robinson gave England the lead again at 26 minutes. Two minutes later Welsh sent a defense-piercing pass through to fellow debutant Broome for England's third goal. The fourth came a few minutes before half-time from a wonderful solo effort by Stanley Matthews, who controlled a high ball superbly, beat three German defenders and fired past the German keeper. But as the half ended goalkeeper Vic Woodley's failure to clear the ball properly allowed young German center forward Jupp Gauchel to narrow the gap to two goals. Early in the second half, Robinson restored England's three-goal lead with a low drive that veteran German goalkeeper Hans Jakob did not expect. Broome missed a great chance for his second goal when he got by left back Reinhold Münzenberg, but sent his shot straight at Jakob. With less than 15 minutes left, Pesser reduced the gap once again when he seized on confusion between Woodley and right back Bert Sproston to score Germany's third. But England were not to be denied their three-goal victory margin. With 10 minutes left, the little inside left Len Goulden struck a tremendous shot from 30 yards that went in just under the crossbar and tore the netting away from it. The result surely demoralized the German team. The next month in Paris, they managed only an opening round 1-1 extra-time draw against Switzerland and went out to the Swiss in the replay, 4-2. A little more than a year later England and Germany were at war. The career statistics of the players who took the pitch that day demonstrate the toll World War II took on their playing careers. England played no official internationals in the seven years between May 24, 1939 and September 28, 1946. Of this England team, only Stanley Matthews wore the England colours following the war, and he was never again the international goalscorer he had been before the war. The Germans continued playing internationals through 1942, but, expelled from FIFA immediately after the war in 1946, did not resume international play until late1950. Of this German team, only Andeas Kupfer played internationally after the war, and then only once, in West Germany's single 1950 match. The annexation of Austria by Germany meant that there was a vacant slot for the 1938 World Cup Finals, which FIFA subsequently offered to the Football Association, who, once again, turned down the offer to appear in France, and instead, embarked on a continental tour. We have relied on kicker sportmagazin's 100 Jahre deutscher Fußball (November, 1999) for Germany's player details rather than Keir Radnedge's The Complete Encyclopedia of Football (1998), which occasionally differs on club affiliations and caps and goals totals, because we believe reputable sources in the country that hosted the match are generally the most reliable. Moreover, the club affiliations set forth in kicker sportmagazin are confirmed by those listed in the German team roster for the 1938 World Cup, played the month following this match, appearing in Ken Knight, John Kobylecky & Serge Van Hoof's A History of the World Cup Volume 1: The Jules Rimet Years 1930-1970 (1998). For the same reason, we have used Deutscher Fussball-Bund records for the attendance and the sequence and times of the goals rather than editor Keir Radnedge's The Ultimate Encyclopedia of Soccer: The Definitive Illustrated Guide to World Soccer (4th ed. 1997), which has the attendance as 103,000 and the goals as follows: Bastin, 12 mins. ; Gauchel, 20 mins. ; Robinson, 26 mins. ; Broome, 36 mins. ; Matthews, 39 mins. ; Gellesch, 42 mins. ; Robinson, 50 mins. ; Pesser, 70 mins; Len Goulden, 72 mins. The Green Flag Team England official website and Niall Edworthy's England: The Official F.A. History (1997) put the attendance at 110,000, while Nick Gibbs' England: The Football Facts (1988) has it as 115,000 and Ron Hockings & Keir Radnedge's comprehensive Nations of Europe (1993) as 120,000.